how the election is going to turn out this November? Now's your chance to prove it. 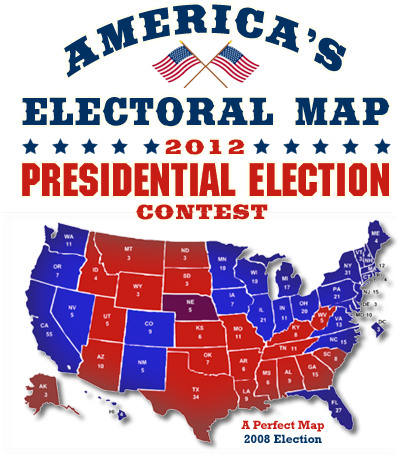 Your entry will also help us to create America's Electoral Map --- an effort to use the 'wisdom of the crowd' to forecast the 2012 election. Valid entries submitted in August will be eligible for all 3 prize periods; in September, 2 prize periods; and in October, the 1 remaining prize period. 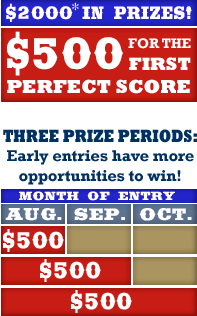 All valid entries eligible for First Perfect Score. *Prizes Awarded as Amazon.com gift cards. Choose one of the Get Started map links on this page or visit 270toWin during the contest period, which ends October 31,2012. Fully complete a map (zero undecided electoral votes) and select the "Vote Map" button. Complete the entry form and ENTER.